Rhiannon Lay was determined not to be a drop-out statistic when she became a mother during her junior year at Apollo High School in Glendale. 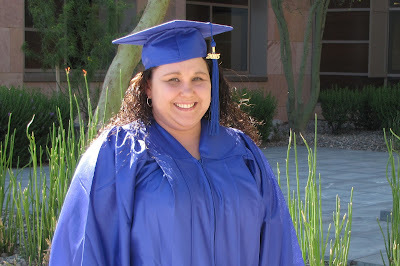 So she transferred to Mesa Distance Learning Program and completed her high school certification online. After high school, Lay got married and was raising her three young daughters. She worked in the banking industry and took some classes at a for-profit college. Then Lay got a job as a property and casualty insurance specialist with USAA. The job was more than an income. It paved the way for Lay to earn a college degree. USAA is one of several Valley companies that partner with Rio Salado College to offer industry-specific workplace education. 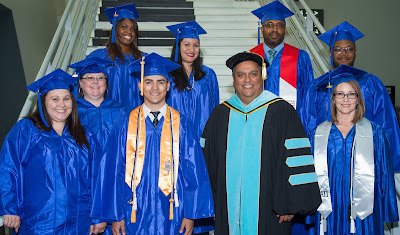 Employees get customized training that earn college credits leading to certificate and degree completion. Employers get a more educated and engaged workforce. “Since 2002, more than 5,000 USAA employees have successfully completed their workplace training and earned college credits through our partnership,” said Susan Lawrence, Director of Corporate and Government Partnerships at Rio Salado. During her first year at USAA, Lay enrolled in a certificate program. “I was determined to set a good example for my daughters and let them know they can do anything they set their mind to,” Lay said. When the certificate program ended, Lay met with a Rio Salado advisor and learned that some of her previous college credits could be applied to a degree program. Lay graduated from Rio Salado in May with an associate degree in organizational management, and has already experienced the benefits of her education at work. “We’re encouraged to think outside the box to solve problems and find innovative solutions, so I find myself putting my coursework into practice almost daily at USAA,” Lay said. Although she admits going to school while working full time and being a full-time parent was a lot of hard work, Lay plans to pursue a bachelor’s degree at Arizona State University in the fall. “Nothing worth having comes easily,” she said. For more information about Rio Salado’s corporate and government educational partnerships, visit www.riosalado.edu/partnerships or call 480-517-8512. Photo 2: Rhiannon Lay with other 2015 Rio Salado graduates who took advantage of workplace training credits to earn a degree.